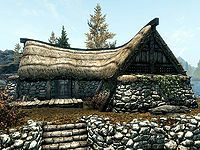 Klimmek's House is a residence in the southeastern part of Ivarstead, located across from Vilemyr Inn. It is the home of Klimmek and Bassianus Axius. It consists of one zone, Klimmek's House. * Moves to Riften after The Book of Love. Klimmek's house is laid out in an L-shape, with the front door entering to an open kitchen and dining area along one side of the "L", and the bedroom area situated on the other. To the left of the door as you come in is a dining table holding two loaves and one piece of bread, some sliced goat cheese, a chicken's egg, a bottle of wine, and a bottle of alto wine. There are also two more chicken's eggs on the floor beneath the table, and a respawning food barrel in the corner to the right of the table. To the right of the door is a non-respawning cupboard holding pots and tankards on the shelves, along with a bucket and a sample of troll fat at the top. A respawning food barrel sits to the left of the cupboard. To the left of the fireplace is another respawning food barrel, atop which sits a full goat cheese wheel. Three gold coins rest on the mantel of the fireplace, and a cooking pot sits on the right side of the fireplace base. To the right of the fireplace is another dining table holding two potatoes, one garlic bulb, three seared slaughterfish, some sliced eidar cheese, three loaves of bread, a head of cabbage, and a leek. Four more potatoes sit in a kettle to the left side of the table, and four woven baskets sit on the floor to the right. Above the table are some hanging ingredients, including dried frost mirriam, two garlic braids, and two portions of dried elves ear. Next to these hanging ingredients are two hanging racks, one of which holds two freshly caught rabbits while the other holds two pheasants. On the bottom of a set of shelves to the right are two bottles of alto wine and three bottles of wine, along with the books The Code of Malacath, Kolb & the Dragon, Olaf and the Dragon, and A Gentleman's Guide to Whiterun. Next to these shelves is a non-respawning wardrobe. The bedroom area of the house starts with a bed owned by Bassianus Axius along the southeast wall, next to a non-respawning end table with a copy of Nords Arise! sitting on top for reading material. 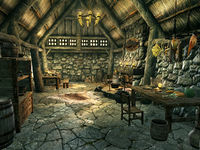 The other owned bed (belonging to the IvarsteadKlimmekHouseFaction) is found on the southwest wall, flanked by a non-respawning end table on either side and with a non-respawning chest at the foot of the bed. The left end table holds a farm hat and a potion of haggling, while the right one holds a basket and four gold coins. A pair of farm boots sits on the floor in the left corner, in front of a medium-sized coin purse. Along the left wall is a non-respawning wardrobe, atop which lie a sabre cat pelt and a belted tunic, and next to which rests a respawning food barrel with a bucket on top. Along the right wall is a small sitting area, with a table holding two bottles of Nord mead and a couple of tankards. The front door has an apprentice lock, the key to which is carried by both Klimmek and Bassianus. At the front door to the house is a respawning food barrel. Behind the house is a dead tree with a growth of scaly pholiota. This page was last modified on 21 July 2017, at 21:26.